Shillong born and Baroda trained Prithpal Singh Sahadev Ladi (b. 1955) is one of the sculptors, emerging in the Indian art scene after the mid 80s who through their praxis brought about paradigm shift in modern-day Indian sculptural activity. It is, however, not that they had no inspiring predecessors who defied naturalistic and formalistic norms, to prioritise their individual experience and reflexion of the here-and-now reality. In an autobiographical note Ladi has said that though his being born a Sikh, brought up in Christian surrounding, being able to speak several languages are not unimportant, are, nevertheless, coincidental. In the same note Ladi implies that none of these conditions, nor even the learnt axioms of doing things are essential. It is only the existence within these conditionalities that is important. 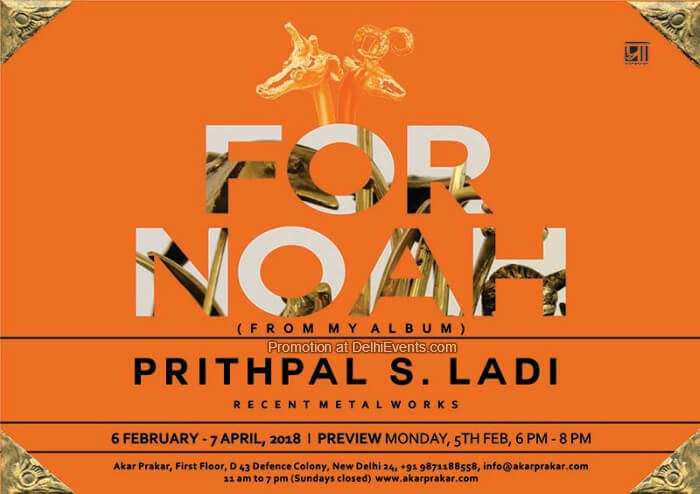 Like what he frequently did in the past, in his present series also, Ladi has taken up a myth, a Biblical myth at that; the myth of Noah’s Ark. The image of the fragile cardboard shelter of a boat, with vacumn inside, holding teeming hapless living kids of speechless animals, at once establish the narratives as no-descriptive allegories, wherein what happen on the surfaces are less important than what are being allegorized. The theme of the surfacial allegorical narrative reveals itself only through a careful insightful viewing. Ladi comes into view as a human being concerned with deceitful human pretense of saving flora and fauna from deluge, and futility of it all. His own comment on the futility comes through the wit and humour with which he manipulates the relative proportions and gestures of the images. About the artist: Born in 1956, Shillong, Prithpal Singh Sehdave Ladi studied sculpture with distinction at MS University, Baroda, 1981. He was awarded the national LKA award, 1981, Gujarat LKA awards, 1978, 1988 and the inaugural Bendre Husain Award, 1989. He received several scholarships; from government ones to the Ecole Superieure des Beaux Arts, Paris, 1981-82. He taught sculpture at the School of Architecture, Ahmedabad and NIFT, New Delhi. Among his shows are: solo at Jehangir Art Gallery, sponsored by RPG, Mumbai, 1996, the 8th Asian Biennale, Dhaka, Contemporary Indian Art, Peru, 1998, Edge of the Century, New Delhi, 1999, solo at the Gallery Goethe, sponsored by the Kulturefferat, Munich, 2000, See through, an exhibition in glass, British Council, New Delhi, 2001, Art from India, Gallery Muller and Plate, Munich, 2002, Art from South East Asia, Munich, 2003, his works represented the country at the Asian Art Show, Fukuoka, Japan and Seoul, South Korea, Sacred Space, Jehangir Art Gallery, Mumbai, 2004, solo show at gallery Threshold, New Delhi, 2008, his miniature works were shown in New York by the Saffron Art at their special jewellery section, thence at, Religare gallery, New Delhi and some participative group shows in Mumbai. Lately he has been working from Kolkata, courtesy of Akar Prakar and the Lalit Kala Akademi. Ladi’s works exhibit his penchant for the eccentric and strange. A more direct realism is seen in works like ‘Wishing Well’ and the untitled sculpture of a man reading in his bathtub. Ladi infuses his sculptures with a queer humor that enables the viewer to access them at different levels moving effortlessly from the familiar to the fantastic, or from the apparent to the suggested.